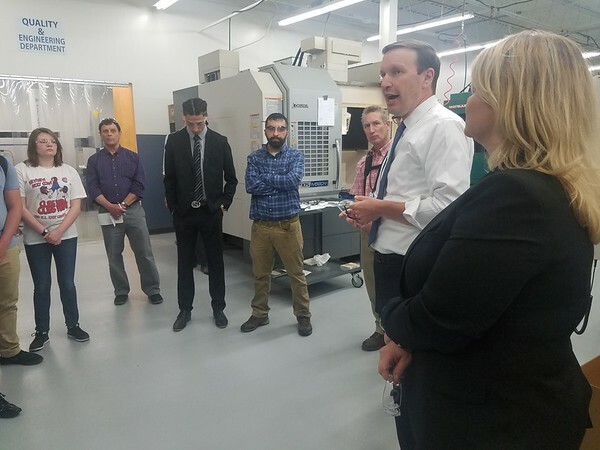 NEWINGTON - U.S. Sen. Chris Murphy was joined by students from New Britain High School in a recent visit to a manufacturing company to host a town hall meeting and learn about career opportunities. Murphy, D-Conn., toured Richards Machine Tool Co. Inc. along with the owners, employees, and students from New Britain High School who are interested in manufacturing. The senator took questions from students, and advised them about the bright future that manufacturing can offer in Connecticut. Companies such as Richards play a big role in the prospective manufacturing workforce, as they let interested high school and college students train, intern, and work in the company. The owners of Richards, Dorothy Weber and Lillian Bartkowicz, said they want to show students with a vision that there is a future in manufacturing. 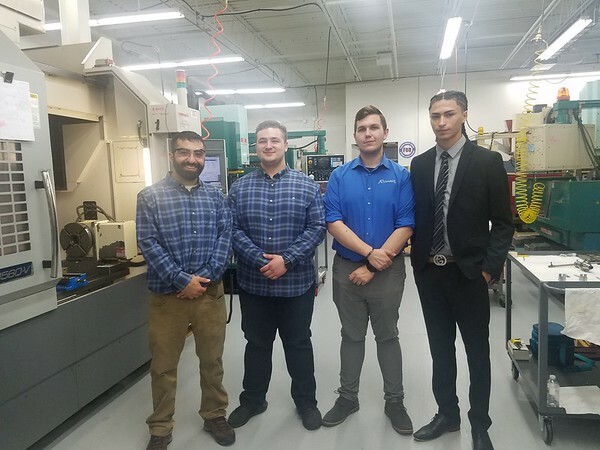 Right now, Richards employs two students from Tunxis Community College, one student from Central Connecticut State University, and one student from New Britain High School. Murphy said there is no need to discourage non-traditional careers such as manufacturing, which a lot of times don’t require a four-year college degree. Murphy added that he would like to see more integration of practical and classroom experience both at the high school and college levels. He said students can learn faster through practical experience. Richards’ owners said sometimes it is difficult finding workers who value manufacturing, which is why they started to integrate younger workers into their company. They also said it helps the students figure out what they want to do in the future and whether they wish to continue a manufacturing career. New Britain High School brought their students to the tour at Richards because the school will soon be starting academies in manufacturing, engineering, IT, and other careers. Murphy also praised Richards because as a manufacturer, it is owned by two women. The senator took a chance to encourage the students and other women to get into the field by explaining that companies such as Sikorsky are the future of Connecticut. Murphy added that Electric Boat is also going to be growing. Murphy also said he would like to see those jobs in the hands of Connecticut workers. “These are good jobs, these are jobs that have a good wage, health-care benefits, and there’s opportunity for advancement,” he said. Richards was featured as a Monday Manufacturer by Murphy in 2016. The company was started in Berlin by the owner’s father before he died, and their specialty is high-precision machined components for the aerospace, automotive, and medical industries. Posted in Newington Town Crier, Newington News on Tuesday, 5 June 2018 20:43. Updated: Tuesday, 5 June 2018 21:18.